Inheritance is an institution of great antiquity which has been regarded with favour or even with reverence in a wide variety of cultures. 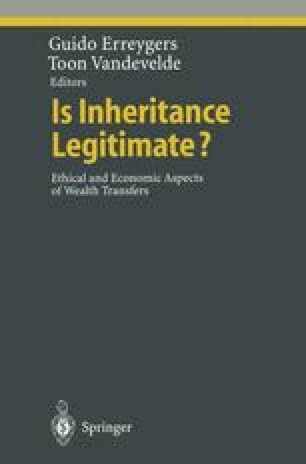 In the King James translation of the Bible, there are about 125 references to inheritance, all favourable; the sense of the word is sometimes material, sometimes moral or spiritual, and sometimes a mixture of the two. The transmission to the next generation of both a moral and a material legacy is regarded as a duty; the members of the present generation are not so much the absolute owners of material possessions as their stewards. The Lord forbid it me, says Naboth to Ahab, that I should give the inheritance of my fathers unto thee. (I Kings XXI 3).